Hi, I am interested in your 1986 Chevrolet Blazer 4WD (stock #4631-ATL) listed on Autotrader for $24,995. I'd like to get more information about this vehicle and confirm its availability. Its got the rugged good looks of a classic SUV, but with a strong running condition you dont often find in its counterparts of the era. Piloting this 1986 Chevrolet K5 Blazer Silverado is no cross your fingers and hope for the best exercise - its very much ready to drive - and with its powertrain recently rebuilt combining with 4-wheel drive surefootedness, this is one seriously versatile ride. The K5 Blazers are a sturdy looking bunch. Broad and brawny, its been professionally lifted and has generously sized wheel wells capable of accommodating the 35-inch thick rubber with plenty of clearance; this K5 is more than a mere grocery-getter and although this 86 is plenty well-suited for everyday driving conditions, itll thrive in more rugged territory as well. Resprayed four years ago, its looking great in its gray paint, accented by the removable black top and black chip-guard bottom. Very clean bumpers sit both fore and aft, with the former strengthened by a matching brush guard, and the combination of shiny brightwork and blacked-out trim throughout the Blazer give it a tough, custom look. Befitting of showing-off on both the trail and the blacktop. The removable hard top is a great feature - sitting in place, its clean condition and contrasting black color really add to this Blazers crisp appearance, while removing it adds another dimension - converting this versatile vehicle into a semi open-air all-terrain cruiser. The interior is in good condition while retaining a sort of spartan quality thats very much in keeping with this sturdy SUVs identity. You wont find many aftermarket touches on display, but the elements inside have received enough recent attention to freshen the entire cabin. Both the front buckets and rear bench seat have plenty of miles left in them and have retained their shapes well to provide plenty of comfort on the road, and a nicely sized center console sits up front to offer plenty of interior storage space. The dash pad and gauge panel are new, as is the full-length carpet, and in keeping with the highline Silverado trim option, R134a A/C, power windows, and power locks are all welcome options. Youll find a Grant GT steering wheel at the head of the drivers control, while just beyond it the dash area also retains its factory condition and displays a set of clear gauges in its instrument cluster. An aftermarket CD player, steering column-mounted tachometer, and a pair of auxiliary gauges are the only deviations from stock and modernize the drivers road experience. With a recently rebuilt 350 V8 sitting under the hood, this truck has plenty of power to handle whatever comes its way. Built approximately 500 miles ago with all new internals including a Summit cam and flat top pistons and topped with a Summit carb and Edelbrock aluminum intake, the engine is running strong and smooth and pairs with a 4-speed automatic 700R4 transmission (rebuilt at the same time as the motor) to make up a very capable drivetrain. An HEI system cranks the K5 with ease, spinning the serpentine belt system and emitting a throaty rumble flowing from the longtube headers that feed a new dual exhaust system. While engaging 4-wheel drive in so many vintage trucks is often a laborious process, here the feature is in good form - with a flick of the lever sitting within easy reach, it engages seamlessly for those times when the terrain beyond the asphalt beckons. Yet with power steering and power front disc brakes on board, this classic Chevy also has the road manner suited for everyday driving. Bring it up to cruising speed, then step down on the brake pedal and it tracks straight ahead on its new 15 blacked-out wheels wrapped with Mud Claw M/T radials. Purchased new at a dealership down the street from our showroom, this Blazer has lived its entire life in warm Georgia. 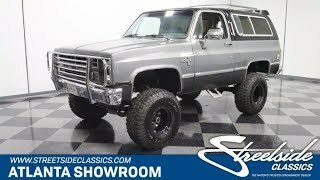 Fully sorted and built with an eye toward both style and function, this 1986 Chevrolet K5 Blazer Silverado is truly a vehicle for all seasons. Call today!